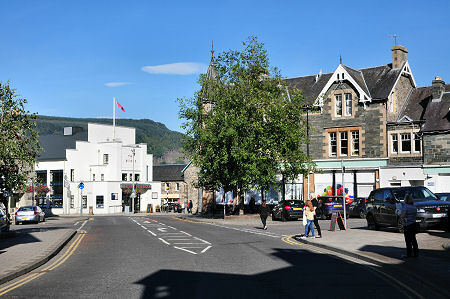 Aberfeldy is a bustling small town built on the south side of the River Tay. It sits at the point where the upland road south to Crieff meets the east-west road along the valley formed by the River Tay. It owes much of its early growth to the first bridging of the river here in 1733. Aberfeldy's Tay Bridge, also known as "General Wade's Bridge", is a beautiful structure still used by modern traffic, though only in one direction at a time. It was built as part of the network of military roads put in place by General George Wade following the 1715 Jacobite uprising. The bridge was designed by William Adam, father of the rather better known Robert Adam, and built in 1733. Ironically, the new military roads were initially of most help to Bonnie Prince Charlie during the 1745 Jacobite uprising. Overlooking the river and bridge, and with stunning views north west to the Glen Lyon and Ben Lawers mountains is the Black Watch Memorial. This was erected in 1887 and commemorates the first mustering here of the Black Watch as a regular army regiment of the line in May 1740. A little way beyond the bridge is the small village of Weem. Here you can find the magnificent Castle Menzies, and the Old Kirk of Weem, now the Menzies Mausoleum. Aberfeldy also has associations with the poet Robert Burns who wrote the lyrics to the Birks of Aberfeldy having been inspired by walks along the Moness Burn and through the birch woods. Today "The Birks of Aberfeldy" is a very popular walk offering views of several waterfalls. Aberfeldy itself spills out in all directions from its heart, The Square, and offers visitors access to a range of shops, amenities and accommodation. A significant addition to the centre of the town came in 2013, when The Birks Cinema was restored to its former glory. Its single screen offers a wide variety of films, and the cafe can be thoroughly recommended. Another recent addition is a new Co-op supermarket, which may not have been welcomed by existing shops, but is certainly a bonus from a visitor's perspective. 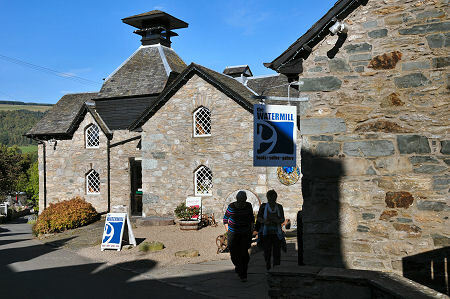 Slightly longer established, having been opened in 2005, is the Aberfeldy Watermill. This offers a bookshop, a gallery, a cafe and more on three floors of a converted oatmeal mill. 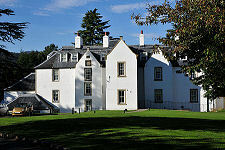 On the south side of Aberfeldy is the excellent Moness Resort, offering hotel and self catering accommodation. Aberfeldy has an industrial history that ranges from cotton milling dating back to 1799 through to laundry and machine tool businesses in more recent times. Today the most striking and, for many, most interesting, industrial heritage revolves around distilling. The history of distilling in and around Aberfeldy dates back several centuries, and fits the pattern common across Scotland of informal (and illegal) distilling taking place anywhere the locals thought could be kept hidden from the excisemen. Changes in legislation in the first half of the nineteenth century made legal distilling more attractive, leading to fewer but usually more legitimate stills. Distilleries were set up on the outskirts of Aberfeldy and along the Tay valley at Grandtully. Grandtully Distillery survived until 1909. Aberfeldy's own distillery, Pittiely, closed in 1867. It was replaced in 1896 by Aberfeldy Distillery which uses the same supply of water from the hills to the south. Aberfeldy Distillery was expanded in the 1960s and 1970s and today it is home to Dewars World of Whisky, a popular visitor attraction. Grandtully does, however, remain home to St Mary's Chapel, complete with its remarkable painted ceiling. 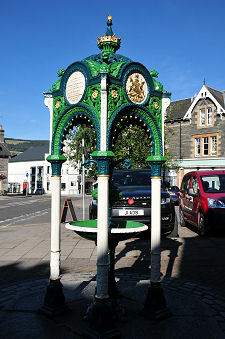 Today's Aberfeldy stands on the 79 mile Rob Roy Way which passes through the town on its route from Drymen to Pitlochry.